This piece provides an overview of the bitterly polarized and consequential political moment in which the United States, along with many other countries, is embroiled in. It also suggests a strategic approach for U.S. progressives and the left to maximize our contribution to defeating the Trump and the far right, and advancing toward racial and social justice. Third, there is a major demographic and migratory shift in the world, transforming the racial and ethnic composition of the west itself. Symbols of these demographic trends are Obama’s election and reelection and the intense political polarization over immigration in Western Europe and the U.S.
Fourth, the danger of environmental crises, especially climate change, has greatly increased just as more countries like China and India are becoming enormous consumers of fuel and other natural resources. The ongoing wars in the Middle East, other resource wars, increased natural disasters and the international fight over global warming are symbols of this trend. In this light it is no accident that for the last thirty-five years the majority of the corporate class, along with the politicians who represent them, has moved strongly to the right, grasping for even more political and economic power for themselves by attacking the standard of living of working people at home and opponents abroad. At the same time, rightwing racist populism–the grassroots rightward movement of working and middle-class sectors–has grown more extreme and more powerful. Rightwing corporate capital and rightwing populists are strongly allied, despite their obvious differences and internal fights. Militarism, attacks on the living standard of the working class, along with its organizations, criminalization of Black people, the poor and immigrants, mass incarceration, deregulation, financialization, privatization and gross inequality have ruled the day. And now we have Trump and Trumpism. We are neck deep in one of the most consequential moments in our history. The country, indeed much of the world, is veering towards authoritarianism, war and even fascism. In the U.S., Trumpism—the alliance of racist, rightwing populism with the most reactionary sectors of corporate capital led by a cowardly, narcissistic bigot—is undermining the gains we have fought for and won since the New Deal and Civil Rights. As scholars Steven Miller and Nicholas Taylor report in “White Outgroup Intolerance and Declining Support for American Democracy,” survey data shows that when “intolerant whites” fear that democracy may benefit the growing numbers of people of color, many may abandon democracy altogether. The Trumpists are endangering world peace and the most basic democratic norms, freedoms and institutions, not to speak of the planet itself. In 2016 Trump and his racist populists trounced the Republican corporate elite that had ruled the country as a whole for most of the last 36 years and took control of the party. This reactionary Republican Party now controls the presidency, both houses of Congress, the federal judiciary, 33 governorships, and a record 68 of the 99 state legislative bodies, including both houses in 32 states, not to speak of most of the police and sheriff’s departments in the country. Although she won the popular vote, Hillary Clinton carried just 487 of the country’s 3,181 counties. These rightwing Republicans are on a tear to remake the country in their own image while they have the power to do so. On our side we can be tremendously proud of the vibrant peoples’ Resistance that has surged to meet the Trumpist challenge. Rising up angry, women have created #MeToo, #TimesUp and the Women’s March which confront the patriarchy and sexual abuse that have permeated human cultures since time immemorial. Students have surged forward to provide powerful leadership to the fight against gun violence. Teachers are rallying in their thousands, even in deep red states such as Oklahoma and West Virginia. Bernie Sanders uncovered and mobilized a new generation of radicals. Native peoples surged forward at Standing Rock. Resistance is high among immigrants, Black people, Muslims, and LGBTs. In all of these, young people and women are playing a vital role. Polls consistently show Trump limping at historically low approval ratings though also retaining a large, loyal and well-organized base. Indeed, the country is probably more politically and culturally polarized than at any time since the Civil War. The far right is moving further to the right; the center left is moving further to the left. The space for public dialogue or compromise between the two is almost non-existent. The stakes are immense. It’s no exaggeration to say that we are in a state of peaceful civil war. As of this writing, the prospects look positive, though by no means certain, for the Democrats to take back at least the House of Representatives in 2018 and to beat Trump in 2020. Such victories are absolutely crucial to our short and longterm prospects of defeating the right. However, we are far less prepared to actually defeat the far right or undo the extensive damage it has done at all levels of our country. Without broad and strong state-based and national united fronts anchored by powerful and organized social justice forces, it is likely that the traditional centrist/liberal power players will compromise with the far right, and revert to some version of corporate neo-liberalism. By themselves they will be insufficient to defeat the right at the national let alone state levels and local levels. The fight against the far right is likely to last decades with many ups and downs and a still very uncertain outcome. In fact, the battle against the right has been raging since at least the election of Ronald Reagan in 1980. Reconstruction was crushed after a decade of post-Civil War progress when the Republican elite cut a deal with the white supremacist South. The Civil Rights movement—the Second Reconstruction—has been sabotaged by decades of backlash by an alliance of the Republican corporate elite and racist populists, with collaboration by all too many Democrats. We must not fail at a Third Reconstruction. To prevail, we must decisively win public opinion and build massive organized strength, anchored by determined progressives and social justice forces, that are prepared to persist not just through 2020, but long past. Racism is at the core of rightwing populism in this country. Of course, that populism has numerous important strands: sexism, gun rights, Christian fundamentalism, authoritarianism, economic anxiety, homophobia, climate denial, greed, fascism, transphobia, fiscal conservatism, libertarianism, etc. But, as study after study verifies, it is the perceived threat to white group dominance—racism and its variants such as Islamophobia and xenophobia—that is the critical political and cultural unifying thread of Trumpism and the force that sustains them through ups and downs. The contemporary far right has its origins in the 1960s white backlash against the victories of the Civil Rights movement. But its increasing strength and radicalization centers on dire fear of the power of the coming people of color majority in the U.S. Despite the fact that whites will long be the largest group in the U.S., the far right is launching a preemptive strike—and many whites are willing to sacrifice the most basic norms of democracy to ensure their dominance. Racism is driving authoritarianism. In my opinion, the “coming people of color majority by 2045” is often overstated and the idea that demography is destiny is not useful. Many Latinos are, racially, white, and the racial identity and politics of the increasing numbers of multiracial people is uncertain. People of color are extraordinarily diverse by history, class, politics and ethnicity. Moreover, there is a significant difference between percentage of the population and percentage of voters. In California, for example, whites have dropped to 39% of the population but are still 61% of the voters due to racial differences in rate of citizenship and voter participation. Nonetheless, race is unmistakably the main pivot of politics. Racism is the glue of the far right and they cannot win unless they suppress the votes of people of color. The Democrats, let along the progressives, cannot win without the moral and political leadership and strength of people of color. People of color, most especially Black people, are the most consistent progressive forces in the U.S. And, since the 2000 election, Blacks, Latinos, Asian, Arabs and Muslims have dramatically increased their opposition to the Republicans both in percentages and numbers. Without a doubt they are the core of progressive voters and the moral and political heartbeat of the fight against the right and for social justice. Yet there is still a marked tendency in the Democratic mainstream and among some progressives to take people of color for granted and spend inordinate amounts of time and energy trying to win over white Trump voters. Despite much racial progress, the failure of this country to successfully settle accounts with its foundational history of racism and settler colonialism has, once again, come back to haunt us. If we are to truly defeat the far right, we will need to strike a mortal and sustained blow to racism. The immigrant rights movement and #BlackLivesMatter have contributed greatly to this process, as has revulsion to the white nationalism that Trump has stoked. According to a poll done by fivethirtyeight.com, one of the positive developments of the last few years is the deepening understanding of and opposition to white privilege among liberal and moderate white people. The participation of tens of millions of whites, disproportionately women and LGBT, young and working class, will long be a strategic condition for building a powerful progressive movement, let alone to defeating the far right. Yet downplaying the strategic centrality of the struggle against racism and the leadership role of people of color and other core progressive constituencies dilutes our ability to confront the racist right and to build the kind of multiracial, multi-class movement necessary to win hearts and minds and build power. The fight against racism is seriously impaired without undertaking the struggle for the South and Southwest. The South, in particular, has more population, more Blacks and Latinos, more congressional representatives and more Electoral College votes than any other region. And its power is growing since it has been the fastest growing region for decades, a trend expected to continue well into the future. Yet progressives have largely ceded those regions to the far right. The majority of Blacks still live in the South, augmented by three decades of Black re-migration to the region. Latinos now live throughout the country but the largest concentration is still in the Southwest. Given the dynamics of racism, it is not surprising that the South and Southwest are also centers of poverty and the military industrial complex. If we cede the South and Southwest to the right, we undermine the strength of our most progressive populations and forfeit the moral high ground in the fight against racism, poverty and militarism. Both the South and Southwest are highly diverse and their politics and sociology are rapidly changing. The big cities are getting more numerous and larger, and all vote Democratic, as do an increasing number of suburbs. There are numerous Blacks, Latinos and Native Americans in the rural areas and far more Black and Latino majority counties than anywhere else in the country. Given the racial, economic and political diversity of these states, it is crucial to create a strategy appropriate to each one. Moreover, it is possible to shift the political center of gravity and the coalition that holds governing power. Already Virginia, Maryland, Washington D.C., Colorado, California, Nevada and New Mexico tilt strongly Blue. Florida, North Carolina, Georgia and perhaps Arizona are purple. Texas has virtually the same racial demographics as California and before long will be the most populous state in the country. It can be a national game changer. The women’s movement—led by #MeToo, #TimesUp and the Women’s March—are an incredibly powerful force against Trump and a movement of truly historic potential that challenges oppressive gender relations and sexual harassment that are as old as humankind and almost as determinative as DNA. Not that previous women’s movements have not done the same. But what makes the current women’s movement different is that in its brief history it has demonstrated astonishing power to seize media attention and mobilize supporters, causing the unceremonious ouster of corporate, cultural and political big shots almost weekly. Even rabidly rightwing Fox television has found it in its interest to do so. Of course, there is a long, long, long way to go. Patriarchy and sexual abuse are part of the fabric of most institutions in U.S. (and global) life, from workplaces to schools to households. But #MeToo and #Times Up are off to a very impressive start. The women’s movement has not only won the moral high ground, it has also begun to transform politics. An historic number of women have contended for elected office in these last two years, and an historic number have won. Women candidates have driven Democratic voter turnout, greatly enhancing Democratic electoral results. Sexual abuse is hardly confined to rightwingers or Republicans. It poisons the entire political spectrum and it would be both immoral and politically foolhardy to confine its targets to pro-Trumpers. Women’s leadership has become not just a theoretical necessity, but an increasing practical reality. And the related surge of the LGBT movement over the last two decades is also truly remarkable. This movement has made it crystal clear that it is not morally acceptable nor politically viable to exclude the fight against homophobia and transphobia from the core of the progressive agenda. Another positive development of the last decade or so is the increasing sophistication among progressives about how to navigate the complexities of the U.S. electoral system. Not long ago many progressives were mired in abstentionism, third partyism, or being passive, self-denying Democrats. But, in opposite ways, the victory of Obama and the victory of Trump—as well as the stunning presidential run of Bernie Sanders—have awakened the vast majority to the crucial importance of organizing both inside and outside of elections, and both inside and outside of the Democratic Party if we are going to build a powerful, independent social justice movement that might one day achieve governing power. The U.S. two party system sets high bars of funding and scale of operations to seriously contend and is fraught with racial and wealth inequities. The Electoral College violates even the basic democratic principle of one person, one vote. We must fight to democratize the electoral system against the dominating role of big money, to eliminate the racist and undemocratic Electoral College, denial of the vote to former felons, pernicious gerrymandering and other forms of voter suppression. Many of these reforms would require us to accumulate enormous power in Congress and state by state strength to meet the high bar of constitutional change. This strength can only be forged by struggling within the current system. Failure to seriously engage in elections marginalizes us from the fight for political power and public opinion, blocks us from organizing the hundreds of millions of voters and constrains our fight for policies and programs that shape the lives of everyone who lives in this country. First, the majority of laws that govern our lives are decided at the state and local levels, not the federal. 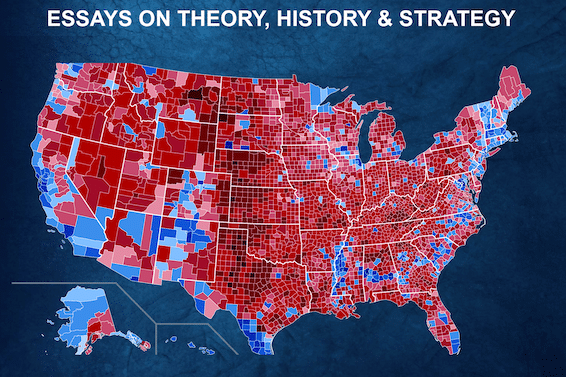 Second, the presidency is decided not by the national vote, but by the tally in each state. Third, the federal Congress consists of representatives elected in the states. Fourth, state governments generally control redistricting which has an enormous impact on congressional and legislative electoral outcomes. Fifth, the political dynamics and forces vary quite drastically from one state to the other, requiring unique analyses and strategies tailored to each state. Indeed, a real national strategy would be extremely inadequate if it did not include state strategies. And last but hardly least, the state level presents a much more favorable and manageable terrain and scale compared to the nation as a whole at which to build mass organization and power. Without mass progressive organization we will significantly remain at the mercy of the powers that be. Trumpism presents a clear and present danger of expanded and intensified wars, on many fronts and continents, up to and including the previously unthinkable possibility of nuclear war. The administration has already embarked on a massive military build-up and appointed a Cabinet replete with war criminals. Terrorism, or the often-exaggerated threat of it, might well be the excuse Trump uses to embark on new wars, especially with Iran. Yet one of the important unresolved issues facing progressives is how to reinvigorate the peace movement and respond to terrorism. The U.S. has been at war since Bush launched his attack on Afghanistan following Sept. 11. These wars in the Middle East have now lasted five times longer than the U.S. involvement in WWII, wasted hundreds of billions—maybe trillions of dollars, killed tens of thousands of people, displaced tens of millions of people from their homes and homelands, crushed the societal infrastructures (government, public safety, schools, neighborhoods, health care systems, etc.) of several countries, and caused a massive increase in poverty. Even when the antiwar in Iraq movement reached massive proportions in the early 2000s, it was an extremely rare domestic social justice organization that participated. While social justice individuals turned out en masse to the demonstrations, almost no organization adopted an official antiwar position let alone crafted antiwar programs or appointed staff to help build the antiwar movement or actions. Seventeen years later, somehow most U.S. people have normalized war and even the antiwar movement has not awakened to the new dangers posed by Trumpist militarism. We cannot be an effective opposition to the right, let alone defeat it, if we do not place the struggle against militarism and for peace at the center of our agenda. Of course, it is not just the far right that is creating havoc in peoples’ lives. Contemporary corporate capitalism is producing gross inequality and misery alongside obscene wealth at an accelerating rate. For example, California is by far the richest state in the union and it is politically dominated by Democrats, many of them self-styled progressives. Yet last year the U.S. census announced that, when cost of living is considered (especially housing), California has the highest poverty rate of any state in the country! This puts progressives and social justice forces in a complicated relationship with corporate, anti-Trump forces. On one hand, we know there’s a good chance they would make all sorts of negative compromises with Trump and Trumpism if they are put back in power by themselves. On the other hand, they hold so much political, economic and media power compared to the social justice forces that it is pretty much impossible to conceive how we could defeat Trump and Trumpism without their participation. Many corporate leaders, media and pro-corporate politicians are already engaged in the fight against Trump, and it would not be surprising to see many more join in if, for any reason, corporate profits or the stock market significantly wane. We are, necessarily, in a complicated unity and struggle relationship with them, not unlike the relationship the rightwing populists have navigated with the corporate Republicans for the past forty years. Realism about power relationships and skill at changing them is a hallmark of a serious movement. Yet the abysmal results of high tech, financialized capitalism—even at its best as in California—ought to be a signal that social justice cannot be approached, let alone achieved, without confronting corporate power and beginning to effect a real social transformation. Such a transformation is purely hypothetical unless we are able to massively build our forces within the broad front that can defeat the right and divide the corporates. Within this, the specifically left and social justice forces will need even more power to be able to advance toward a new era of social progress. The struggle against the far right and for a Third Reconstruction cannot be victorious without constructing a sweeping alliance and progressive program that includes and speaks to the needs and dignity of all working people for peace, democracy, and social and environmental justice. These fights will surely involve tremendous collisions with corporate power and the corporate structures which are the root cause of much of the inequality, poverty and war in the world. First, we need to correctly target the main enemy, which for some time ahead is the Trump-led racist authoritarian right which has captured the Republican Party and controls the vast majority of the federal, state and local governmental elected and non-elected bodies. Second, to defeat the far right and simultaneously to lay the basis for social advance when this is achieved, we need to create broad national and state united fronts with a unified inside/outside strategy, organizing inside and outside elections, the Democratic Party and the halls of power. Third, our strategy needs to centrally incorporate racial, economic and gender justice and be connected to our core progressive social base of people of color, poor folk, labor, women, youth, LGBTs and students. People of color and women’s leadership will be crucial to ignite working class-oriented racial and social justice movements and to defeat the right. Fourth, we must fight for the South and Southwest in order to give substance to and build the power of people of color, the fight against poverty, the fight against militarism, the struggle against the far right and to contend for power in the largest and fastest growing regions of the country. Fifth, despite the blows that the corporate powers have rained down upon labor, as well as its own internal inconsistencies, the labor movement is still one of the most powerful parts of the anti-right and progressive movements and the centerpiece of the crucial fight for economic justice. Increased political unity between the social justice and labor movements is key to the future of our movement and our country. Sixth, we must have a governance strategy, not a strategy limited to “influence” or “impacting public policy and debate” and certainly not a strategy of self-righteous isolation. The people and the country need us, but only if we take ourselves seriously enough to prepare to govern. Seventh, we must build independent, progressive power, but also strategic and ecumenical coalitions in order to build real power inside and outside of the Democratic Party, but to simultaneously play a major role in an “anti-right” front against the Republicans and rightwingers who are our main enemies. Eighth, we need to simultaneously work national, state and local strategies, remembering that states are key building blocks of our electoral and governmental systems. Ninth, we need to grasp the intimate interconnection of the fight for social justice with the fight against militarism and for peace. Tenth, we need to dramatically broaden and deepen our concept and practice of communications work if we are to reach tens of millions and fight for public opinion. Last, even as we prioritize the urgent task of defeating the right, we need to prepare the ground for a profound social transformation, a Third Reconstruction. That would be a period when peace and social justice forces are powerful enough to set a governing agenda that makes unprecedented strides toward peace and racial, gender, social, economic and environmental justice, but which is short of, yet perhaps might open the way to, a post-capitalist society. There are many more elements to an adequate strategy, and countless more that will emerge as we intensify the struggle. How can we maximize the diminishing strength of labor? What is the strategic meaning of the changing nature and divisions within the working class and what sectors might be able to play a role similar to the industrial proletariat in the past? And, besides communities of color, what other social forces among working people can be mobilized to be the antiracist and class anchors of the multiracial, multi-class social justice movement? What is the role of the environmental crises and the environmental movements? And what about the complicated historical and ongoing problems of Marxism and socialism—of all varieties—in forging a sustainable, equitable and democratic future? Hopefully, however, I have provided some substantial ideas that will be useful to consider in the critical process of advancing social justice work, especially its electoral component, in the coming years. This publishing project consists of this book and an accompanying website: bobwingracialjustice.org. The website contains much of my written work from my fifty years of activism while this book focuses on my writings since 2000. The website features four Power Point presentations on Trump and Trumpism and my most ambitious theoretical piece, “Towards a Communist Analysis of Black Oppression and Black Liberation,” coauthored with one of my lifelong partners-in-crime Linda Burnham in 1981. It also includes many essays, many of them collectively written, from the 1970s and 1980s on then burning topics such as Racism and Reaganism, the Harold Washington and Jesse Jackson campaigns, nuclear war and nuclear disarmament and the United Front Against War and Racism. This volume contains more recent essays—since 1999—all but one of which can be found on the Internet. The book is divided into three sections. The first part, Contemporary Politics and Political Strategy, consists of an analysis of politics, race and strategy since about the year 2000. It traces the deepening of political polarization in that period, and especially the rise of the racist far right and the increased power and unity of people of color. It proposes the outlines of progressive political strategy in that light with a significant emphasis on the importance of the South. “Notes Toward a Social Justice Strategy” is notable as my attempt to analyze the structure of the U.S. electoral system as a basis for a leftwing electoral strategy. The second part, History and Theory, compiles my main essays on racial theory and racial formation. Among other things these essays try to grasp the distinction and intersection of nationality oppression and racial oppression as experienced by Blacks, Latinos, Asians and Native Americans, and to draw out their strategic implications. My most comprehensive theoretical piece, “Towards a Communist Analysis of Black Oppression and Black Liberation,” (1981) is not included. It can be found on my website at bobwingracialjustice.org. The third part is made up of a few short journalistic pieces on topics such as Chokwe Lumumba’s mayoral victory in Jackson, Israel building a great wall around Palestine and the castigation of Barry Bonds. In closing, I wish to give thanks and so much more to Linda Burnham and Max Elbaum, my dear comrades, friends, co-thinkers and co-conspirators–through thick and thin–for more than forty years. This year marks my fiftieth year of activism, organizing and writing. I cut my teeth as a freshman in the pitched battles at the University of California, Berkeley in 1968-1969, especially the Third World Strike. These struggles swept me into the exciting beginnings of both the Asian American and people of color (then called Third World people) movements—and abruptly launched me into confrontation with the iron fist of the state which mobilized at least ten thousand armed men every day for eight weeks to beat us down. We won, and Ethnic Studies was born. Those early years were filled with great optimism. Despite the many assassinations and imprisonments of peoples’ leaders, the COINTELPRO program and the murderous U.S. military operations in Vietnam and elsewhere, mass revolutionary movements were winning literally all over the world, from Southeast Asia to Southern Africa to Central America. In the U.S. we helped bring down the president responsible for the Vietnam War. Like thousands of other young activists, I quit school and threw my body and soul into this antiracist, anti-imperialist movement that was transforming the world in the image of regular working people, peace and social justice. My work has centered on antiracism which I have always understood to be intimately connected to anti-imperialism and class politics. I had the great luck to work closely with the Third World Women’s Alliance as well as powerful people of color left leaders who were gay and lesbian. The antiracist Marxist left became my home base. Despite a very thin pre-movement intellectual background, I also became immersed in theory and history, and what became a lifetime attempt to link these with strategy and practice. One of the underappreciated contributions of the left at that time was that we either founded or re-founded Black, Latino, Asian American, Native American, women’s, gay, peace, working class and environmental studies, reshaping all fields of social and historical inquiry and the intellectual life of the country as a whole. In the mid-nineties I was fortunate to get linked to a new generation of radicals, mostly people of color engaged in community organizing and the antiwar in Iraq movement. Since then I have been founding editor of the racial justice publication, ColorLines, and the antiwar newspaper, War Times/Tiempo de Guerras and the mass antiwar coalition, United for Peace and Justice. Aside from immersion in the antiwar movement following Sept. 11, most of my work has centered on racial justice community organizing and linking it to electoral work. My main practical and intellectual concern has been trying to figure out how to help build the racial and social justice movement to truly mass proportions and power to effectively combat the burgeoning far right. Much of my new book, Toward Racial Justice and a Third Reconstruction, traces my analysis of this central problem and this introduction focuses on the struggle against Trumpism. The accompanying website, www.bobwingracialjustice.org contains the contents of the book and most of my other written work.